Today we worked towards our Cyber Chip Patch. This patch involves an informational video that helps to prepare youth for proper internet usage, cyber bullying, cell phone usage, texting, etc...as well as a game module on the computer to practice. Cyber Chip expires each year and should be done annually, not just for a patch, but to protect our children from internet predators and identity protection Also, March’s Scouting Core Value is Compassion. We will be doing some related games showing the Scouts how someone with a disability such as sight or hearing, struggles with some of the things we take for granted. This will also count towards Elective 4f under group games. Next week we are due to have a special visitor discussing bicycle safety concerns. For the Elective 14 section on pets....I am still waiting on confirmation because we work opposite hours, but my neighbor trains seeing eye dogs and she has welcomed us to visit the facility she works at in Bethlehem. They do tours on the first Wednesday of the month and I am waiting to see if we can get in April 3. That would take the place of our regularly scheduled Thursday meeting. 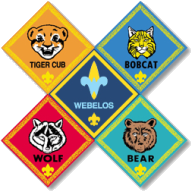 In preparation, your scout can complete some of the other electives at home, taking care of a pet and.or reading a book about one if you don’t own one. If we can get April 3rd pinned down, we will probably begin reviewing some of that information after the bike safety presentation next week. See you at the Derby!!!! !